LAST UPDATE: SHE’S A SHE, AND SHE’S FREEEEEEEEE!!!!!!! YAAAY IT ATE CAT FOOD! Update update: SUCCESS! AS OF 3AM CENTRAL STANDARD TIME MPR RACCOON MADE IT TO THE ROOF!!!! Update, it’s climbing back down!!! You guys, my heart, I can’t take this much longer! 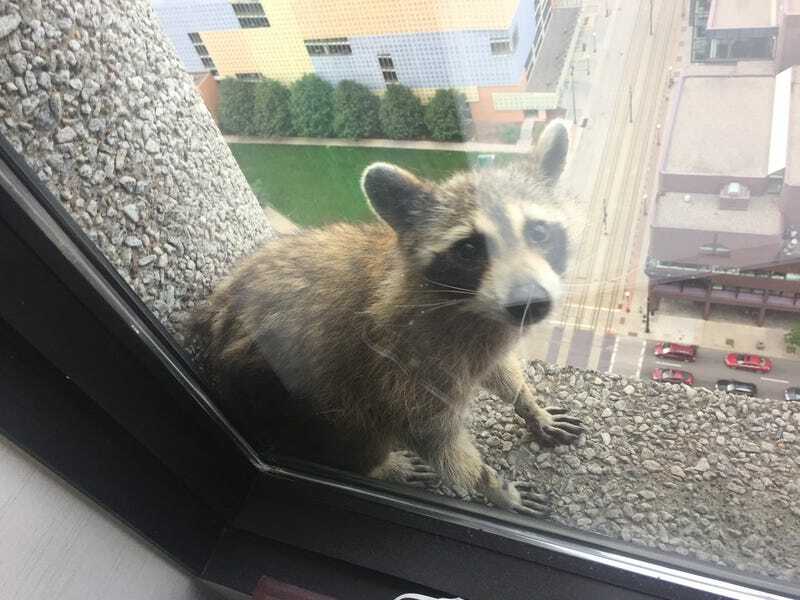 For those woefully unaware, a very hungry little raccoon was trying to get at a nest of pigeon eggs a couple of days ago and ended up stranded on the ledge of a skyway. From there, things escalated (literally), and it ended up scaling up 23 stories on the UBS building in downtown St. Paul. The mayor, the fire department, and animal control are all monitoring the situation. It’s made it to the top floor and only has a few feet more to climb to get to the roof and food! They won’t break a window or send anyone to catch it for fear that they’d startle it and send it falling. They also want to keep people safe, and it’s a huge ask to have people risking their lives for a raccoon. HANG IN THERE, TRASH PANDA! WE ARE ALL ROOTING FOR YOU!